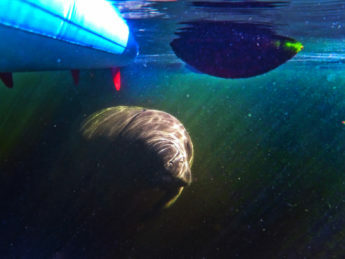 Paddleboard Orlando: manatees - nature adventures just beyond the city! So, you know how we’re all about kayaking and do it all the time? Well, after many attempts I’ve had an incredible time Stand Up Paddleboarding (SUP) and it’s going to be my new favorite activity. 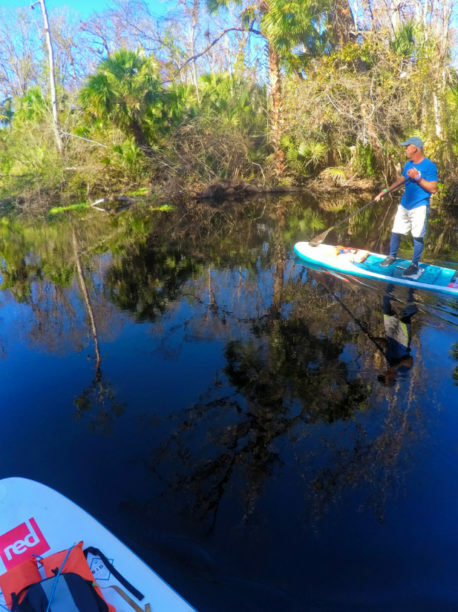 After spending a whole day with Ned, the owner of Paddleboard Orlando, I can say with great certainty that SUP is what’s been missing from our travels. 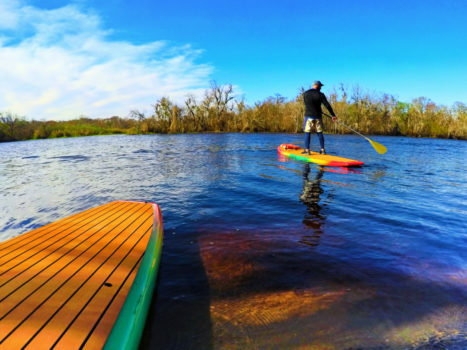 Spending time at the theme parks and resorts is great, and totally fun and relaxing, but if you wanted to spend a day of your time in Orlando paddleboarding, you’d not regret it. 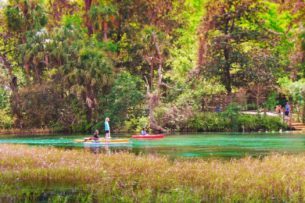 Central Florida is home to a never-ending list of fresh water springs and rivers and they’re so easy to experience in addition to your Orlando trip. 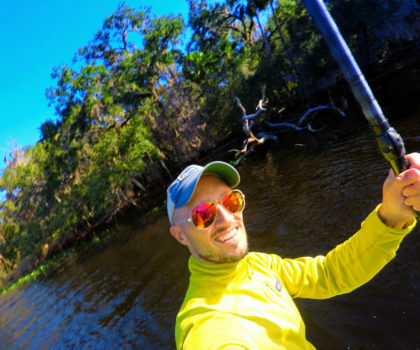 Special thanks to Ned of Paddleboard Orlando for taking me out into Florida’s incredible backwoods for some amazing moments AND thank you to my buddy Tenacious Tom, the coolest SUP guide around, for letting me use some of his images in this article. Give them both a follow on Instagram for loads of nature and SUP inspiration. Trying a new sport or activity can seem daunting or stressful but it doesn’t have to be. Paddleboarding was both really intimidating to me and kind of hilarious until I did it. Immediately I realized the error of my ways when I discovered that it’s actually fun and much more of a workout than I thought. You know, you see people drifting by on their paddleboards and they look lazy almost, but paddleboarding is actually a combination of strength, balance and endurance. If you think you don’t have one of those three things, that’s okay. What you lack in balance you’ll make up for in strength. Where you don’t have the strength, you’ll find your endurance. You just don’t know until you try. Tip: it’s okay to do your paddleboarding experience on your knees or standing. As long as you can paddle, you’re good to go. And remember that everybody does things differently and not everybody is good at everything. I was discussing this with some other guests of Paddleboard Orlando. Paddleboarding is a unique recreational opportunity where you can access some of the most calm, and beautiful places without any sort of impact on the environment. Same with kayaking. Paddleboarding is incredible exercise that works muscles you don’t realize you have. And it’s so calming too. Fun challenge: if you’re into yoga AND nature, there are paddleboard companies that will combine the two, using wide, stable boards. Yoga and paddleboarding is one of my big goals for 2018. Finding a good, reputable company or guide service is the first step to a great paddleboarding experience. 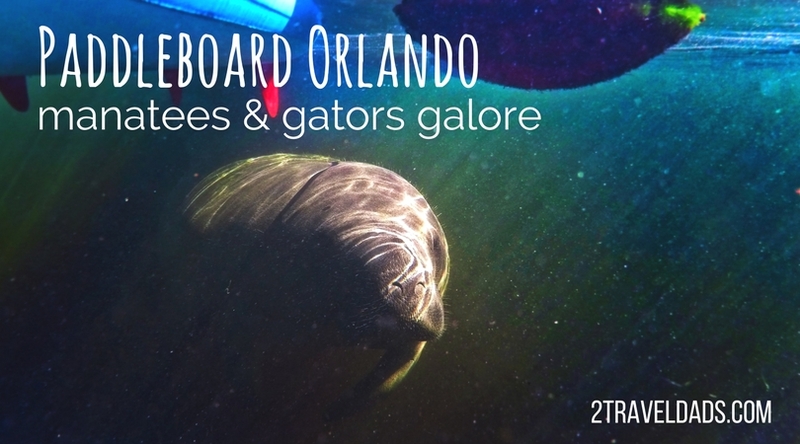 Before spending time with Paddleboard Orlando I stalked them on Facebook and Instagram to see the types of adventures they were taking their guests on and the reactions guests were having. Everybody was having fun and the sights were awesome, so boom! Paddleboard Orlando wins, and they were really great to work with. Paddling up the Wekiva River was a little like paddling through Jurassic Park, only instead of dinosaurs there were turtles everywhere. The untouched banks and crystal clear water were absolutely perfect for spotting them and watching them swim under us. Also seen along the Wekiva River were alligators, egrets and hawks. The gators were awesome! Most of them were spotted outside of the water, just hanging out on logs or bunches of grass. The source of the Wekiva Wild and Scenic River is a gorgeous headspring. Part of Wekiva Springs State Park, there’s a beautiful spring area for swimming and exploring. If you are in the mood for snorkeling, you can check out the crack in the limestone bedrock and the underwater formations, as they’re full of fish. Note: year round the water that bubbles up out of the headspring is 72 degrees F. While Floridians will say that’s too cold for swimming, jumping in any time of year is a great idea and as long as you’re prepared with a towel or sunshine, you’re good to go! Also going out of the Wekiva Island area on the Wekiva River is the jaunt to Rock Springs. A much longer and more wild paddle than the route to Wekiwa Springs, it’s going to take more time and planning, but well worth it. Rock Springs has a smaller head spring but is wonderfully wild. In addition to beautiful birds and gators, you can watch for wild boars and black bears. 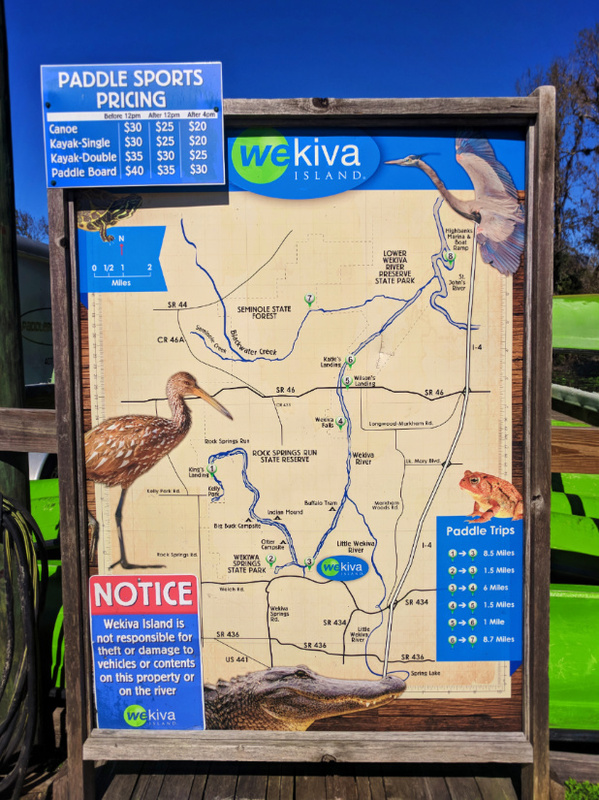 The area all around the Wekiva River is so cool and a hidden gem in Central Florida. You probably already know that this is one of our favorite places in all of Florida. 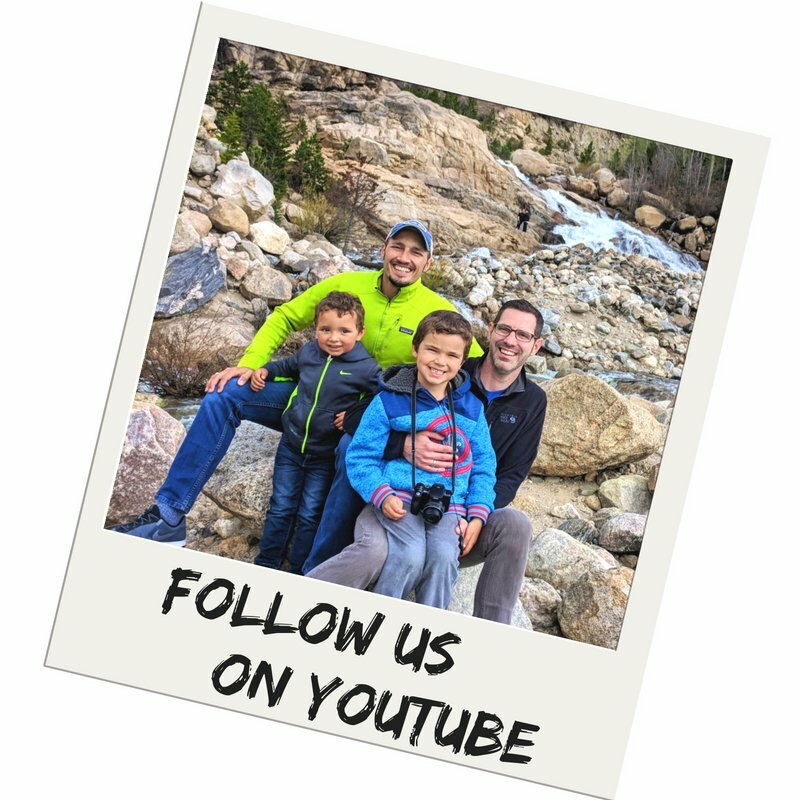 We had an incredible time here with the kids just swimming, hiking through the forest, checking out the springs and counting gar in the water. This is also the destination for hundreds of manatees in the winter months. I met up with Ned of Paddleboard Orlando and we put into the St Johns River at French’s Landing. After getting our bearings on our boards (totally windy day) we started upriver. Wow! What a different view of a river we’d strolled along so many times. There was a branch of the river loaded with egrets and herons. There were bald eagles and hawks flying overhead. And then there were manatees. 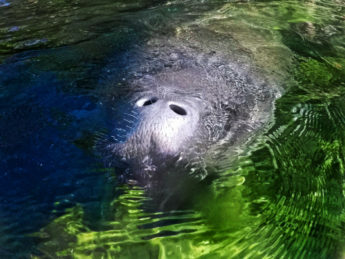 Tip: for info about wildlife safety, including how to respect manatees, check out our article here. 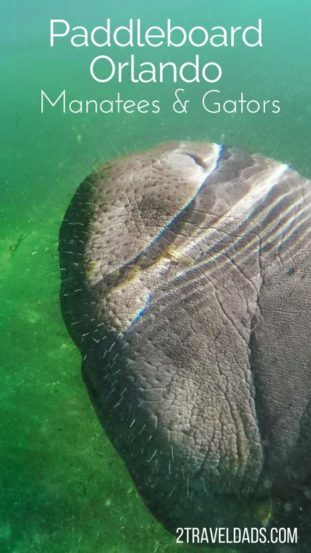 We’ve seen manatees plenty of times, including snorkeling with them in Crystal River, but nothing was like the close up encounters and sheer numbers of them at Blue Spring. We approached the headspring area as far as the buoys and just sat there. Note: paddleboards, kayaks and boats aren’t allowed past the mouth of the headspring area during manatee season, but there are so many you’ll still have an incredible time. After hanging out and being visited by several manatee families, we pulled our boards ashore in the appropriate area and headed for the boardwalks. Observing the manatees and anihingas (water birds) from the platforms along the waterway was awesome! They’re such huge beasts and are so calm. 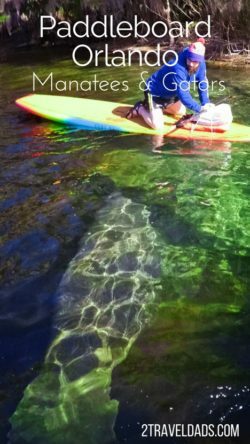 Wildlife paired with really beautiful, crystal clear water made for an unforgettable paddleboarding trip to Blue Spring State Park. Tip: if you have little kids with you, often it’s calm enough to paddleboard with little ones sitting on the boards. 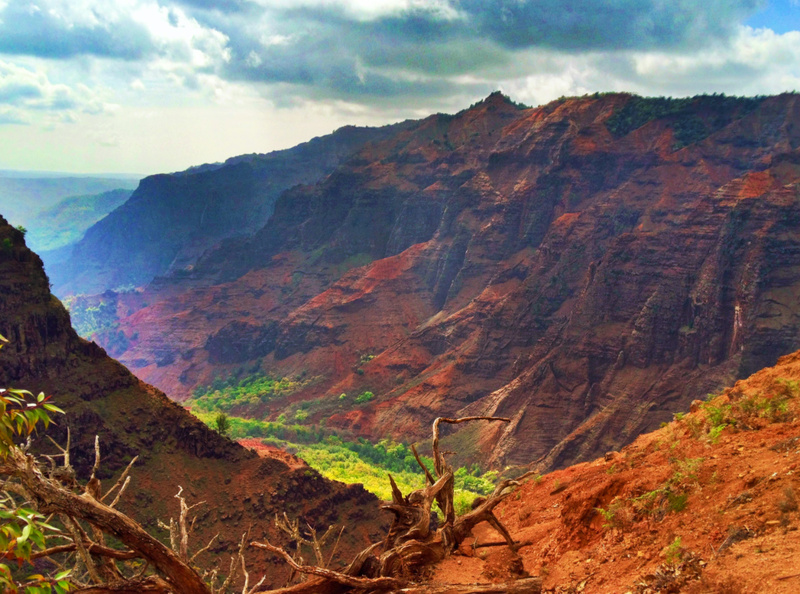 Check with your guide in advance if that’s an option for you paddleboarding destination. Seriously, so many springs to explore all around Florida. 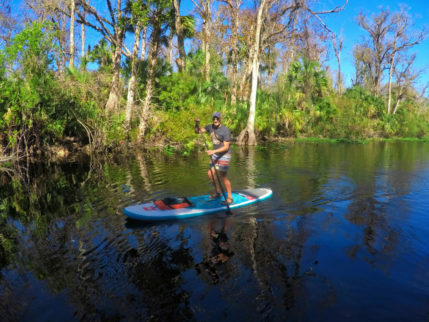 While Paddleboard Orlando doesn’t do tours to all of these places, it never hurts to make an inquiry, either to strike up a new tour or to get a solid recommendation of another outfitter. 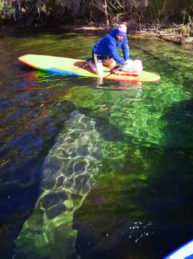 Another amazing Florida spring to check out is Weeki Wachee Springs. 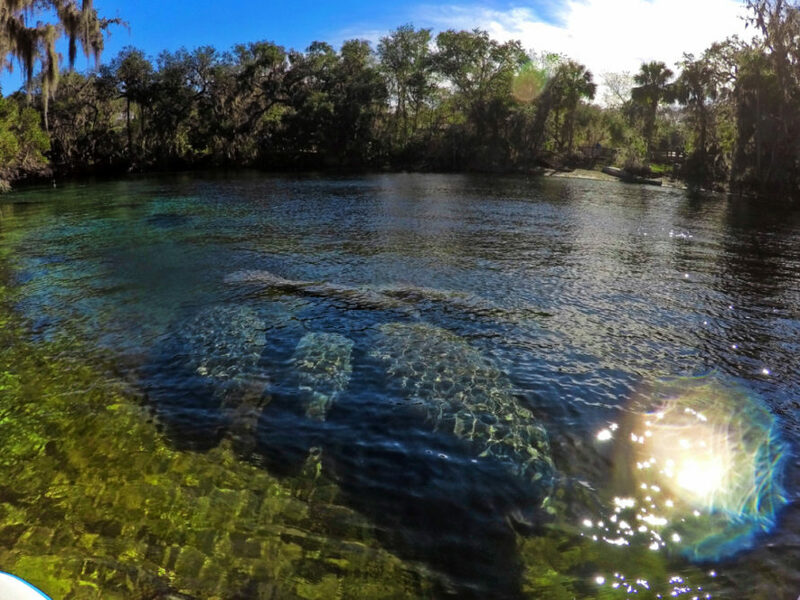 It too is a state park and a haven for manatees… and mermaids. Yes, when it’s not manatee season there is actually a live, underwater mermaid show. I know it sounds bizarre, and it is, but it’s also wonderfully vintage-Florida. We loved Rainbow Springs State Park. The kids enjoyed swimming in the most colorful waters we’d ever seen and even exploring beyond the springs up in hills. 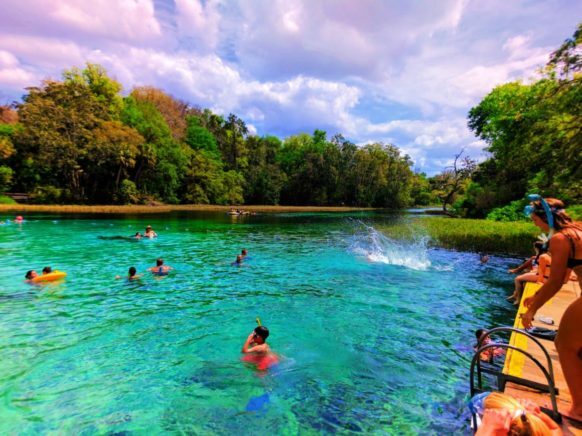 Rainbow Springs State Park has plenty of swimming opportunities as well as dry-land-fun. The site of a former zoo and also an attraction park, there are a bunch of waterfalls (manmade), a butterfly garden, and even creepy old animal paddocks. 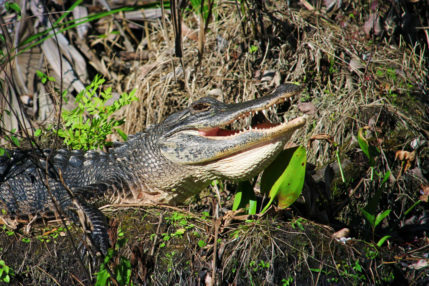 The Rainbow River is known to have a solid gator population though, so any paddleboarding or swimming needs to have a high level of caution and alert. Really beautiful though! Heading a bit farther north you’ll find Silver Springs State Park. This is also a very popular spot for finding manatees, gators and birds of all sorts. 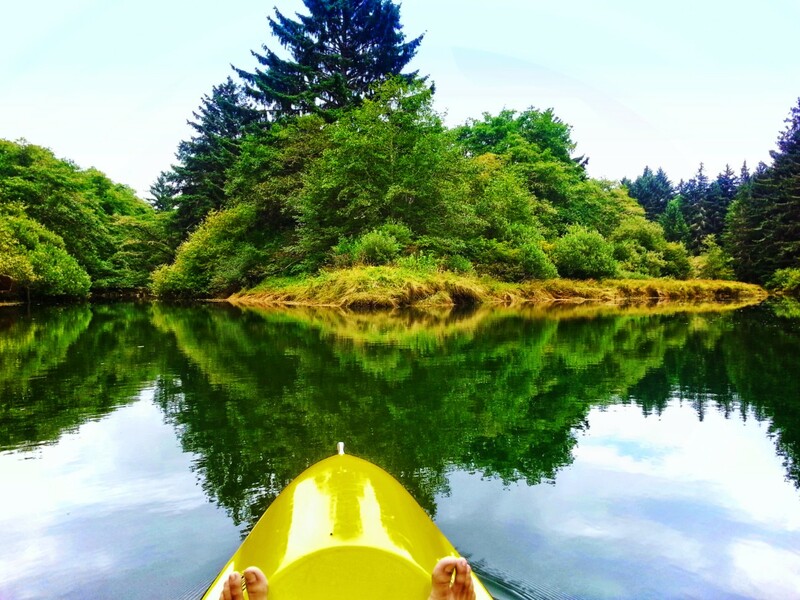 Popular for both SUP and kayaking, Silver Springs is gorgeous and, dare I say it, very Instagramable. Besides the crystal clear waters and tropical vegetation, another interesting sight at Silver Springs State Park are the monkeys. More than 200 macaques run wild in the forest due to being released a long time ago from a private collection and zoo. Today, the monkey’s are closely monitored due to the herpes virus they carry, but can be seen from the waters of Silver Springs. Totally weird. 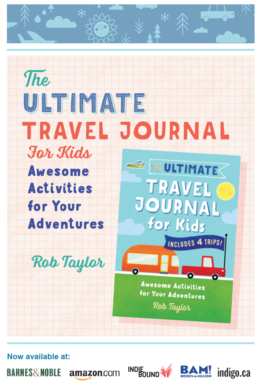 So, not that we would ever tell you to stop enjoying your time at Universal Orlando Resort or Disneyworld, but don’t you just want to plan a day out in Florida’s unique nature? Seriously, we’ve been all over and nowhere else has there been sure a combination of fascinating geology, gorgeously clear water, abundant wildlife, and endless fun. 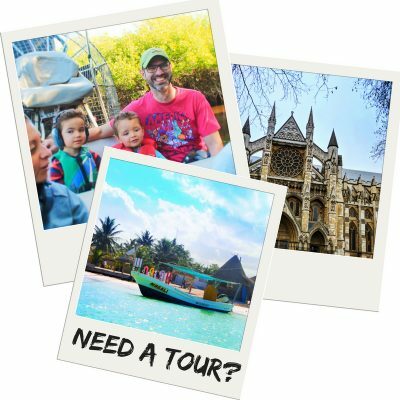 Paddleboarding Orlando and beyond is an incredible experience, for the solo, couple or family traveler alike. Want to pin this for later when you’re planning your Orlando getaway? Go for it!! Also, be sure to check out our plan for a really fun Florida Gulf Coast Road Trip!